MomsRetro Easy No Milk, No Egg, No Butter Biscuits for One or Two This is a simple vegetarian, eggless, milkless biscuit recipe you can whip up in your toaster oven! Emergency Recipe Substitutions For Corn Ingredients Including Cornmeal, Cornstarch and a vintage recipe for Corn Cake with Molasses. This dark, sweet syrup is the secret ingredient in many cookies, cakes, glazes and BBQ sauces. If you don’t have any try these sweet substitutions. This is where I cook up my food and cooking designs funny kitchen slogans for my online stores. Inspired by actual kitchen events! 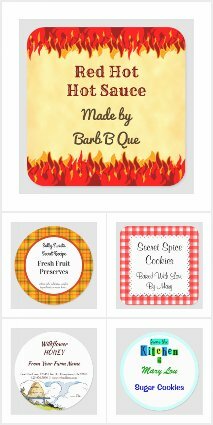 Here’s what Mom is serving up at Mom’s Retro Kitchen Art Store: Mom has her own cooking and retro kitchen art store on Zazzle! What does this mean for you? You can now personalize any design! All my designs come on custom canning labels, totes, aprons, T-shirts, art cards, business cards, new travel mugs and other fun products. My retro kitchen girl is a magician in the kitchen! She’s wearing a top hat, red dress and yellow polka dot apron, her spoon sprinkles sparkles onto the retro lettering. Create your own custom canning, baking or recipe labels with these cute retro designs reading “From the Kitchen of” on blocks of color. Excel-o-rator Coffee original, retro coffee label advertising art — Excel with Excelorator Coffee!!! Quality and satisfaction every time. For mom’s who drive the kids and serve up love from the kitchen on Mother’s Day or any day!